There is a danger with an ongoing series that the magic of the earlier books will wear thin; the combination of characters and situations will become stale; the author will start to stretch the friendship with more and more outlandish and unbelievable events. Luckily, although The Darkest Kiss is the sixth book in the Riley Jenson Guardian sequence, Keri Arthur has not yet run out of fairy dust to sprinkle through the pages. While Arthur follows somewhat down the path beaten by fellow paranormal author Laurell K Hamilton in amping up the sexual situations as the books progress, at the same time this author amps up the suspense and crime-solving aspects as well, nicely balancing the “otherness” of the story with a solid detective yarn. For those who came late, Riley Jenson is a rare half breed in a world where the supernatural exist among us. She and her twin brother, Rhoan, are half vampire and half werewolf, a combination that gives them unusual powers. These powers assist them in their jobs as officers for the Directorate of Other Races, which often means acting as sanctioned assassins of rogue supernatural entities. Added to her natural talents, Riley was previously subjected to experimental drugs that caused emerging changes in her abilities and physiology, changes that no one can predict an outcome for. Riley is unique, even among supernatural creatures, and this uniqueness has its own costs. Central to the strength of the novel is the rich characterization and pacy plot. Although Riley is growing in power and becoming more comfortable in her role with the Directorate, she still struggles with the issues her changes bring with them. Arthur handles this conflict well, developing it without descending into the whiney “poor me” attitude such heroines can be inflicted with in other such novels (not mentioning any names.). Riley accepts and embraces her nature, and while she may be frustrated with the situations it places her in, including those to do with relationships, she finds ways to deal with it. Set against a modern-day Melbourne background, Keri Arthur avoids the parochialism that sometimes invades Australian-set stories, and instead offers an insight into the city without a colonialism accompaniment, which is as it should be in today’s world! In this sixth book we come across a number of familiar characters from the previous books as Riley tracks not one but two supernatural serial killers. Characterisations are expanded and relationships rearranged during the course of the story, while Riley continues to come to terms with her changing ability and searches for the answer to her ongoing relationship concerns. With the multitude of paranormal crime, romance and fantasy books being published at the moment, it’s a challenge for any author to produce a novel that grabs you, pulls you close and suspends your disbelief for over 300 pages. Arthur continues to achieve this feat in her sixth Riley Jenson venture, and I continue to look forward to the next instalment. I’ve really enjoyed the Riley Jenson series. It’s been a year or two since I’ve picked one up for some reason, but I’m really glad to have got back into these books. Riley is a great character; Arthur has managed to keep her interesting without being overpowering (literally and figuratively) and the situations the books find her in are credible and well-crafted. It’s Australian urban fantasy at its best, and holds its own against the big overseas names in this genre impressively. In this, the ninth episode of the Riley books (and the last, I think, although apparently there will be an offshoot series), Riley is wrestling with the decision of whether to quit her death-dealing job and concentrate on her family, or continue in a role she excels at. The forthcoming birth of babies that will tighten the ties between Riley and the men in her life, the loss of her soul mate, and the harsh toll that her job takes on her body, and those around her all make her question the way she lives. Then without warning, she loses it all, and is suddenly on her own, in a way that is baffling and strange. With none of her usual support mechanisms, Riley must figure out why she suddenly feels so strange in her life, and find the way home. Riley is a fabulous character and Keri Arthur works the characters and story beautifully, crafting a detailed and plausible plot populated by appealing people. I’m impressed with the way this series has been sustained through nine books without losing momentum or becoming overdone., no easy thing to do. 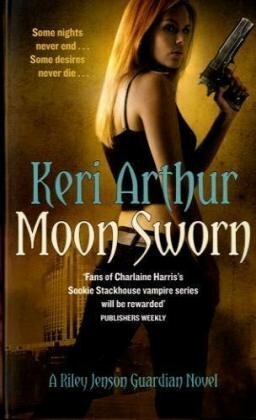 I haven’t yet had the opportunity to read any of Keri Arthur’s other series novels, but now that Riley has wrapped up, I’ll be looking out for alternatives! 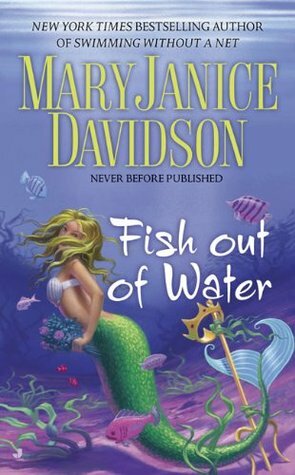 Given that I am a fan of MaryJanice Davidson’s Undead books, I was amazed to discover she had written a mermaid trilogy and I didn’t know about it! Sure, vampires are far more prevalent in the paranormal genre than mermaids, but still, you’d think someone would have told me! Fish Out Of Water is the third and final book of the Fred the mermaid trilogy. Not having read the others didn’t really impact on my reading of this one, although I imagine my emotional investment in some of the characters and the events happening to them would have been stronger if I had read the first two. In this book half-human, half-mermaid Fredericka Bimm, media liaison to the merfolk – who have only recently “come out” to the land-dwelling humans – struggles to balance this role with her new engagement to the undersea Prince Artur and her friendships on land. Add to this strange merfolk disappearances, her own inadequacies as an undersea citizen, and her unresolved feelings for the lothario marine biologist Thomas, and Fred has a lot on her fins. Davidson’s writing is as flippant and engaging as always. Irreverent banter between characters is a trademark of her style, and I enjoyed the quick pace of the story very much. Davidson manages to employ a lighthearted style without telling a shallow story, and is always highly readable. While the novel did stand up to being read out of sequence, I would recommend starting at the beginning of the series (Sleeping With The Fishes and Swimming Without A Net are the first two books – there is also a novella in the anthology “Dead Over Heels”). You will get more MaryJanice Davidson fun, and the sense of character will no doubt be better too. A thoroughly enjoyable, speedy read, and a great break from fat fantasy! An infrequent and random series of posts musing about my introduction to some of my favourite writers. I discovered Lois Bujold on a remainder table in an Australian two dollar shop more than a decade ago. I don’t remember which titles I picked up there. I’m not even sure now whether her name was familiar to me or if it was just chance I decided to buy those slightly tatty (though still unread) paperbacks for the ridiculous sticker price of about A$1.13 each. I did that on occasion back then, when I still read exclusively in print form and still had time to take a chance on books from the remainder bin (sadly these days I don’t even scrounge through these bins any more – so many books, so much digital, so little time…). I do remember they were Vorkosigan books, because for a long time, they were the only books of hers I read. I also know I read the Vorkosigan Saga entirely out of order the first time through, but I loved every single one of them anyway. Whatever those first books were, they led me on a (mostly online) hunt for the rest of the series, which as I recall, arrived in dribs and drabs in mostly the omnibus editions. I devoured each one, and was hungry for more. When Cryoburn came out in 2010, I bought the hardcover edition, something I rarely did, and was delighted when it came with a CD Rom of almost all (bar Memory) the rest of the series in ebook, plus some extra goodies. When Baen offered Captain Vorpatril’s Alliance advance review ebooks for sale, well in advance of release, I bought it. I did the same thing with the recent Gentleman Jole and the Red Queen. And I bought the hardback editions when they came out later, too. Why? Because I adore this series just that much. I have loaned or given copies to at least a dozen people, insisting they much read the Vorkosigan Saga, and I’ve been delighted when they’ve fallen hard too. In 2011, a friend and I read/reread the entire series (to date) – we even won an award for it! But the reading (in internal chronological order this time) and reviewing was a breeze – when you love something, it’s not hard to do. Eventually, I realised that Bujold had written other things, fantasy rather the SF, so I hunted them down, or so I thought. I thought I read the four Sharing Knife books a few years ago, but having just “reread” them in the past couple of months (so good! ), I realise I must not have read books 3 and 4 – if I did, my memory is in far worse shape than I thought! I have no idea why not, as I own them all in paperback (and now in ebook too), and they are certainly MEANT to be read as a single volume, so it seems very strange that I stopped. Not only that, but for years I thought I had read BOTH of Bujold’s fantasy series, and it wasn’t until I picked up her recent self-published Penric novellas, set in the World of the Five Gods, that I realised I had missed all three Chalion books entirely, so I immediately grabbed them and read the lot, back in 2015. That series is next on my comfort reread pile. Basically, I’ll read anything Bujold writes. 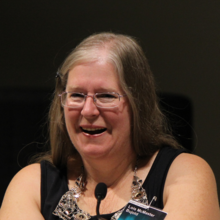 I love that I don’t know what to expect when I pick up one of her books – one of my favourite things about her Vorkosigan series (well, apart from all my OTHER favourite things) is that each book is essentially a different genre, even while all being basically space opera at the core. It’s a clever way to keep a series fresh. Bujold frequently makes me snort with laughter, and all too often has me sobbing, and I think that genuine emotional response to a book is a true measure of its value. I’ve never met Lois in person. I wasn’t part of the convention-going scene in Australia when she was here as a guest. I do hope someday to be able to thank her in person for her words.